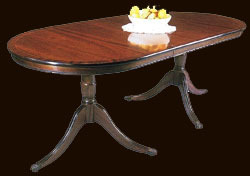 These Regency dining table feature a removable centre leaf that allows 2 sizes of table to be achieved (More combinations on larger tables). The removable leaves and pedestals on larger tables are not self storing. Once you have chosen your preferred wood, finish and shade, select a size that most suits and an end shape that appeals the most. The superior prices include curl veneer for mahogany which produces wonderful flame like patterns, or prime cuts of nicely figured yew. Our mahogany tables feature a gold inlaid line, the yew a black inlaid line whilst the burr walnut tables have a feathered line inset. Our oak tables have no inlays as standard. Add a table cover to protect your investment (table covers are supply from the roll for you to cut as you wish).Bespoke versions of these table are possible - please ask.